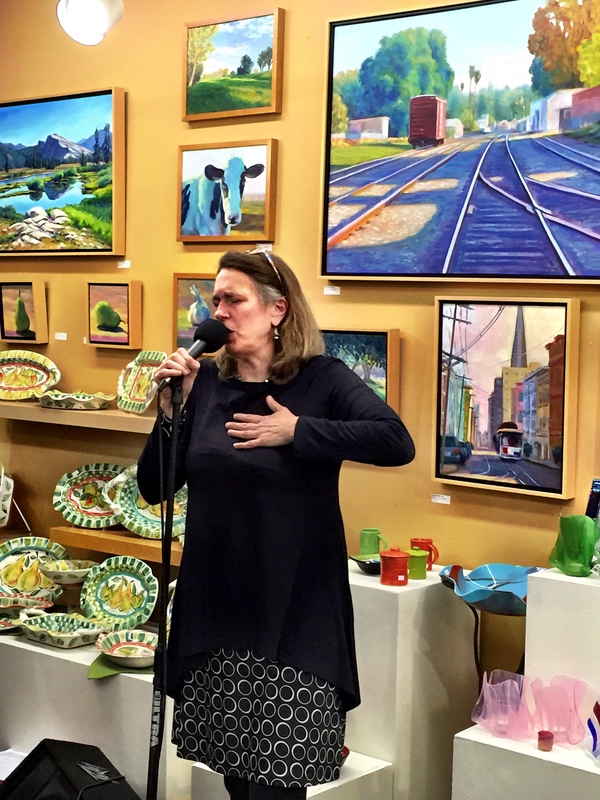 Davis’ monthly Second Friday ArtAbout last night. 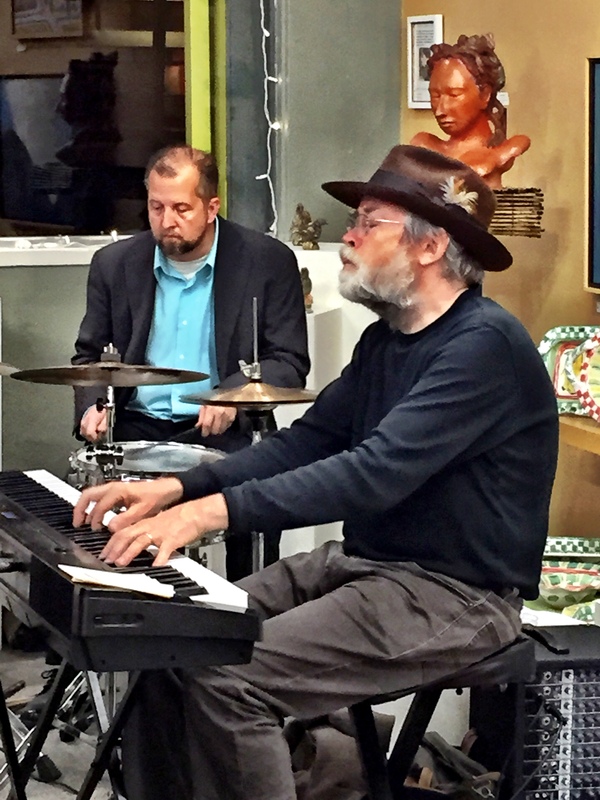 A night each month when art happens all over town, but especially in downtown. Wish we could say we are regulars, but we’re not, but when we hit it, it’s always a good time. 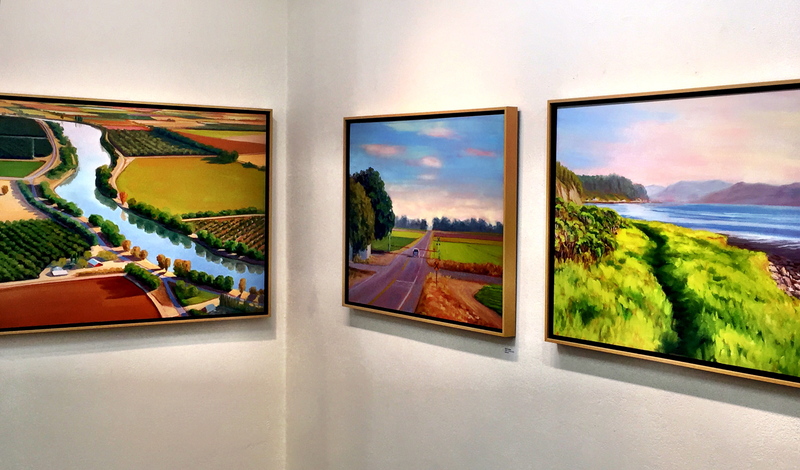 Attended Phil Gross’ opening reception in the gallery at the Artery. Openings are fun, and especially nice when you’re friends with the artist. And friends with the artist’s many friends…then it’s a party. We saw so many folks, including two of our therapists–one former and one current. Conversations with both of them. Gotta love a small town? 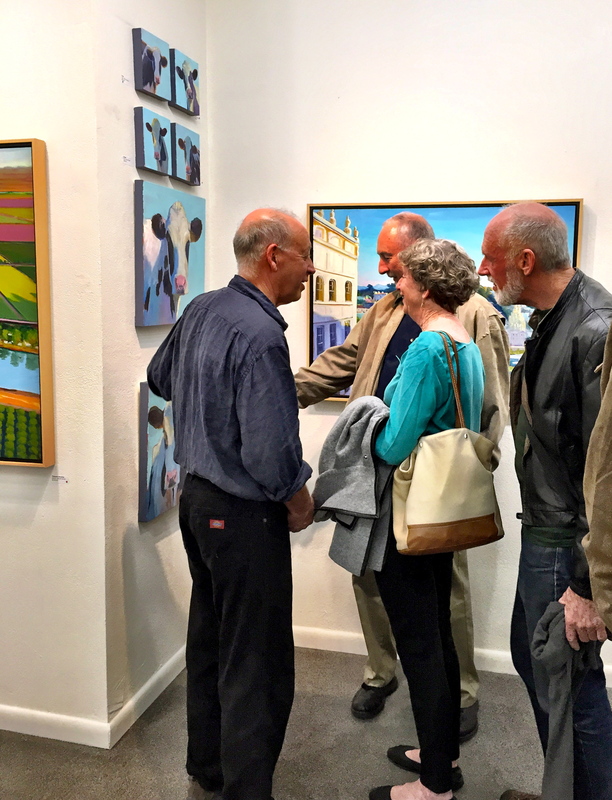 Here’s the artist himself, Phil Gross, talking with Terry, the daughter of my old buddy (RIP) Jean Kauffmann (whose paintings I have a couple of) Terry’s husband Jay, and Jean’s son Doug. Great conversations with all. Here is some of Phil’s work. OMG, I’m a huge fan. I knew that Phil’s been an artist a large percentage of his life (ceramic, music, dance) but that painting was something he took up fairly late in life, but got full the story of what brought him to painting from Phil’s old girlfriend Victoria last night. In short, one day Phil was looking at a painting of an onion in Victoria’s house and, scoffing, proclaimed that he could paint a better onion. She challenged him to do so. He did not paint a better onion, but, being the competitive guy he is, kept at it until he could, got the bug, and has been painting ever since. Only 17 years ago. I remember when he started, and am lucky to have gotten many of his earlier pieces. Way out of my range now. Oh, also? He painted these with his left hand (non-dominant) because he’s getting the shakes in his right hand. 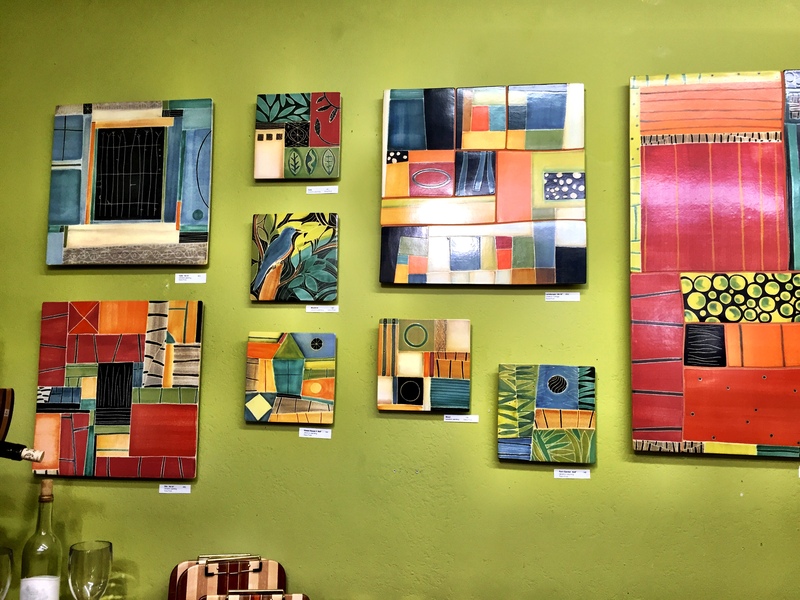 Another favorite artist pair in town are Sara and Tom Post, whose ceramic tiles I am seriously, deeply in love with. 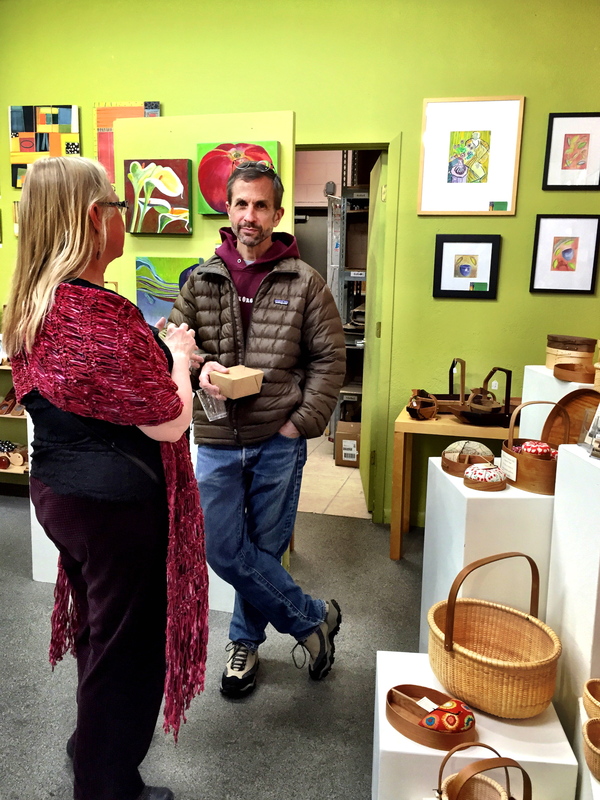 We have a collection of their work–bowls, ramekins, candle holders, a platter, and a couple of single, small tiles–and wish I had a huge hunk of their tile on the wall… if I had a big expanse of blank wall, which I don’t, and if I could afford one, which I can’t. Most of the pieces we have are seconds, purchased at their studio long ago, which’ll have to do. Hooray for Art About! I Looooove Phil’s paintings! I wish I had more money and could afford to buy a few. Love, love, love.